Lord Krishna lived a life that was complete and comprehensive in both worldly and spiritual sense, which is why he is seen as man and god, and also as god in human form. His life and the way he lived have been differently interpreted, and there are many divergent and even contradictory takes on the meaning of his life. 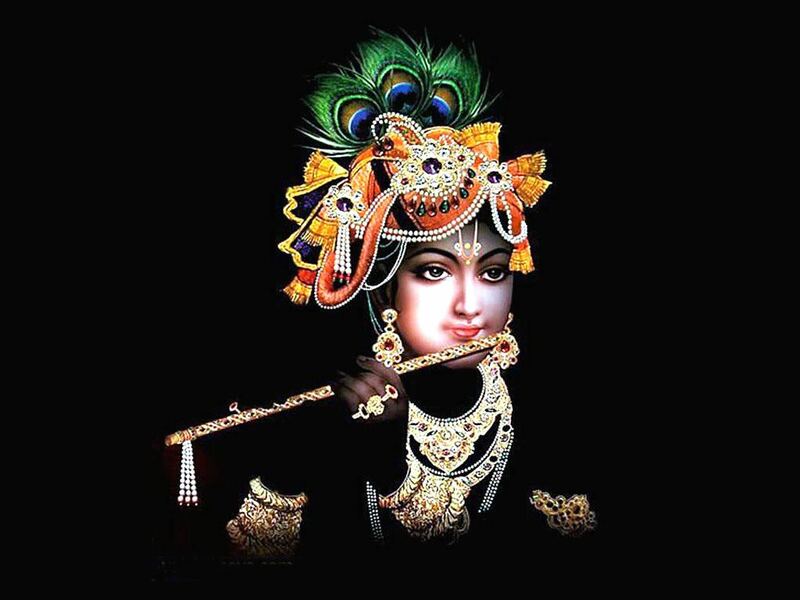 Lord Krishna is an actor and a thinker both, which is unique among all incarnations of Lord Vishnu, seven before Lord Krishna and two after, one of which – Kalki – is yet to arrive. It is interesting to note that the incarnations of Lord Vishnu follow a certain evolutionary pattern. The first incarnation was Matsaya Avatar – god in the form of fish. There was all water in the beginning, and life on Earth began from water. Thus, the God-Fish. 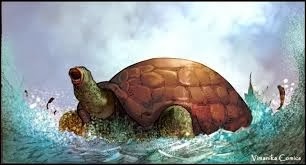 The second incarnation was the Kurma Avatar (God-Tortoise). Tortoise can live both on water and on land. So, that’s the next step in evolution. The third one was Varaha Avatar – the boar. A strictly land animal was the next creature to come because there was enough land for such animals to survive without having to deal with water. The fourth incarnation was Narasimha Avatar , which was half man and half lion, representing the emergence of man from the land animal. The fifth one was Vaman Avatar – the dwarf. It represented complete human form in the growing stage. The sixth one was Parshuram Avatar – an angry, violent sage. This represented the early brute human beings who cared little to think before reaching for the weapon and hitting out in mad rage. 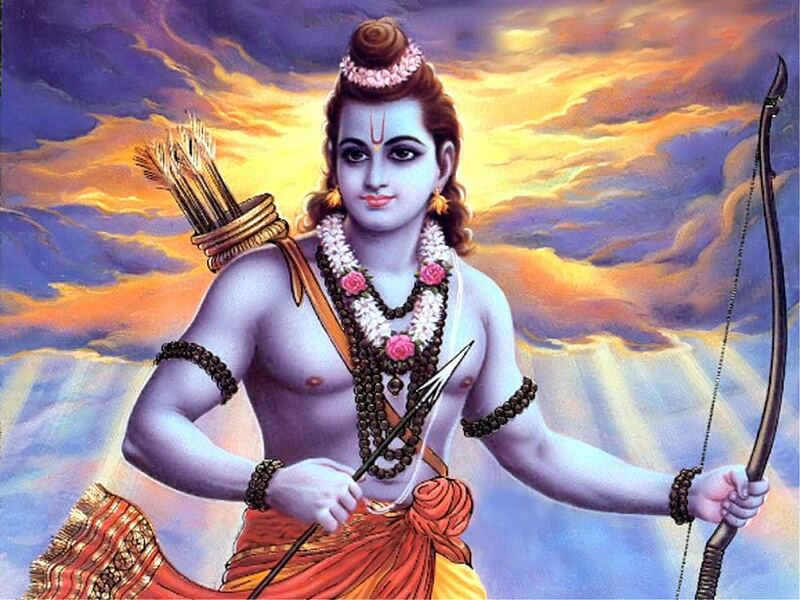 The seventh incarnation was Lord Ram, who was an ideal warrior, prince, son, brother, husband, adversary, friend, father, judge and king. So, from being a brutal being that could use his brain and deftness with arms to annihilate anyone who does not toe his line, man evolved into the law-abiding, civil person, who was better and more powerful than raw Parshuram, but had far greater control of oneself and a far clearer understanding of law, rules and principles of righteous ( maryada ), and who would go to any extent to preserve the sanctity of the law and to act in accordance with it. He was capable of walking the tough path of living, a truly virtuous life without flinching and without thinking twice. Therefore, he was later referred to as Maryadapurushottam . 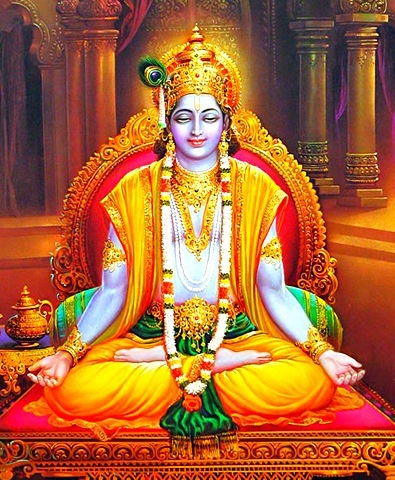 Lord Krishna was the eight incarnation of Lord Vishnu, and was capable of not only acting in accordance with the principles of righteousness but also of expounding them, and also propounding new ones authoritatively as and when the need arises. 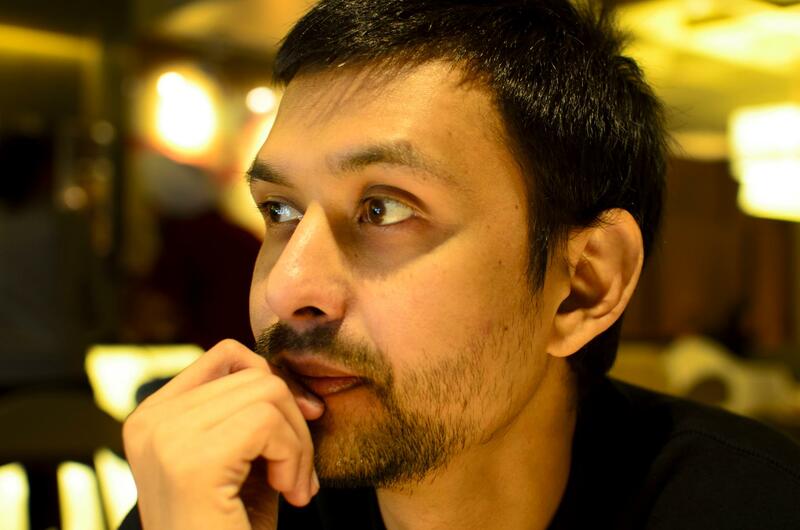 So, he is both the master doer and the master thinker. He is not here just to follow the laws laid down by his fore-fathers, but is here to elaborate upon their true meaning and to explain the underlying spirit. He is neither shy of questioning them, nor does he hesitate in rejecting pointless customs and traditions to replace them with more reasonable ones. This is why he does not hesitate in questioning the relevance of the tradition of worshipping Indra, the god of rain and thunder, for no reason other than fear alone. 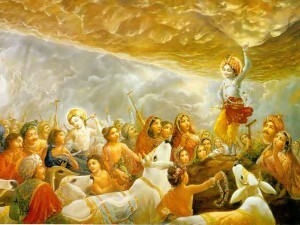 The Govardhan Hill episode is the first instance of Lord Krishna challenging the general tendency to follow traditions unquestioningly, and is also the first time when he puts forth the philosophy of karma , which culminates in the discourse of Srimad Bhagwad-Gita at the very beginning of the Mahabharata war . When Krishna noticed that the farmers of his village were making huge preparations for the annual offering to Indra, he went to enquire about it with his father, who was also the village head. He then discussed the issue with the villagers and argued that as farmers, their primary duty was to grow crops and to protect and take care of their cattle to the best of their abilities. One has to do one’s duty and does not need to make offerings or conduct sacrifices to please the deities. The villagers agreed and did not make any offerings, which angered Indra, who, in turn, unleashed massive rains on the village. Lord Krishna lifted the Govardhan Hill on his little finger to protect the villagers and their cattle. Indra conceded defeat. 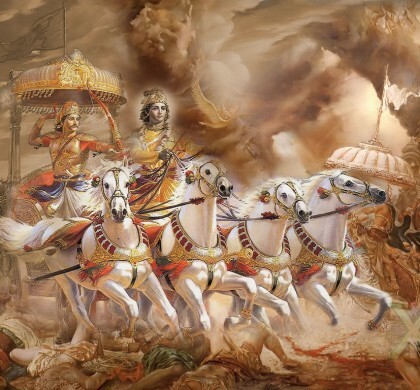 The longstanding custom, which had gathered the force of law, was thus challenged and rubbished by Lord Krishna because it did not serve any purpose, and was being followed simply for the irrational fear of divine wrath. It is after his defeat that Indra recognizes Lord Krishna as god incarnate and requests him to protect his son, Arjun. 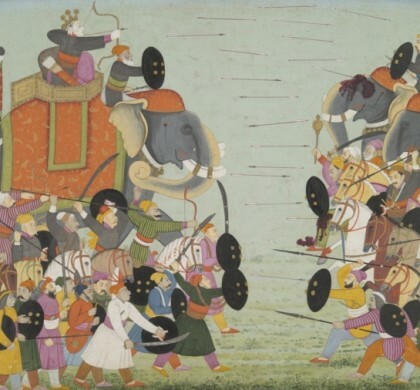 Lord Krishna grants the wish, which is why he keeps Arjun out of harm’s way throughout the war of Mahabharata. While Lord Ram followed the laws and the customs to the best of his ability and did not question a single one of them, Lord Krishna, on the other hand, scrutinizes the laws, argues against those that he disagrees with and fights even the deities if he finds them in the wrong. The difference between the approaches of Lord Ram and Lord Krishna is also there because Lord Ram lived in the times when man had to understand the significance of abiding by the laws for peaceful co-existence. Brute force ruled the world with little regard for the principles of righteousness. Lord Ram demonstrated how a virtuous life in accordance with Dharma is lived. However, in Lord Krishna’s time the Dharma had degenerated into empty rituals and man had learnt how to use rationale to defend the wrong. Therefore, the principles of righteousness were now being misinterpreted and misused by the powerful to further their own selfish interests at the cost of the weak and the meek. Such conduct that was plainly reprehensible had gained acceptance from long practice and needed to be undone through gritty resistance. 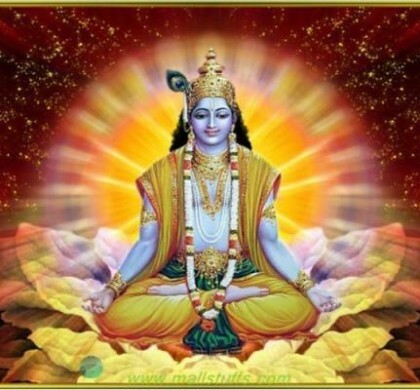 Therefore, Lord Krishna came to re-state as to what was in accordance with the Dharma , for in order to be adhered to, the spirit of the Supreme Law had to be restored and the letter re-cast. Originally published as part of Thinkers and Theory series in Lawyers Update in September 2013.